5/15/16: Council Passes Urban Agriculture Ordinance! This week I felt great pride when the City Council passed our first urban agriculture ordinance. We’ve provided a clearer process for farmer’s markets and community gardens to start in the city, and people can now have a temporary fruit stand in their front yards and more easily raise honey bees. 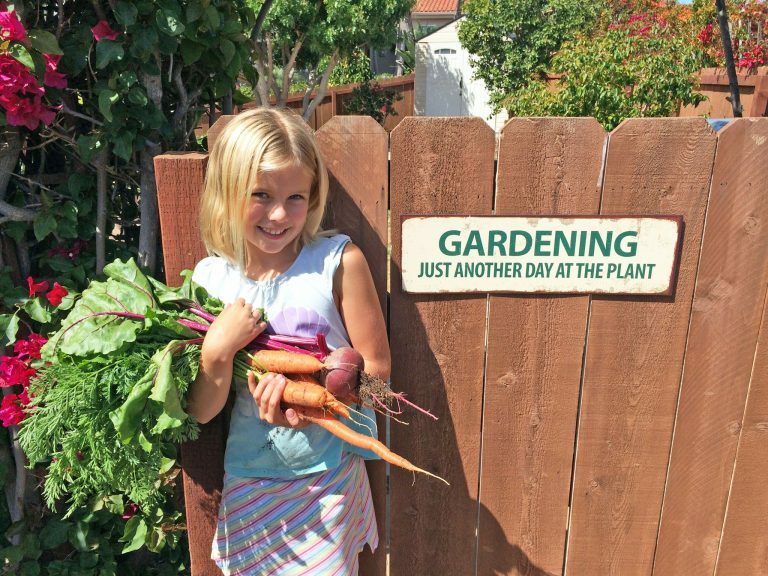 As you know, Encinitas has its roots in agriculture, specifically the growing of flowers. The number one concern that I hear from citizens involves the pace of our growth, increasing traffic and fears about loss of community charm. Finding ways to keep our existing agricultural land and promoting growing fruits and flowers is a hedge against the forces of over-development. If someone wants to grow crops to sell at the Farmer’s Market, let’s make it possible for them. Passing an urban agriculture ordinance was a major goal of mine in running for City Council and I’m so grateful to be surrounded by colleagues and residents who share this vision. Despite the new ordinance, I know few residents will take up farming because it’s hard work, land is expensive, water rates inevitably rise in this dry climate, and urban farming isn’t particularly lucrative. But we’re lucky that some feel the pull toward producing food on their own little slice of earth — it’s soul-nourishing work. An “agriculture permit,” which costs only $250 and is much easier to fill out than a $1,600 minor use permit. The idea is that you shouldn’t need engineers and lawyers just to complete the application. This permit will be used by a school or church that wants to host a farmer’s market, a landowner who wants to open a community garden, or a nursery that wants to transform from selling flowers to doing U-pick strawberries and farm-to-table dinners. Local government, even when well-intentioned, can put too many hurdles in front of projects. Red tape has a chilling effect on the activity. This new, easy-to-fill-out permit is designed to encourage desirable agricultural land uses in Encinitas. Temporary produce stands are now explicitly allowed without permits. If you grow herbs, citrus and avocados, you can now set up a small, temporary stand up to 12 hours per week and sell what you grew to your neighbors. If you turn your apricots into jam, or your cucumbers into pickles, you can sell that too. 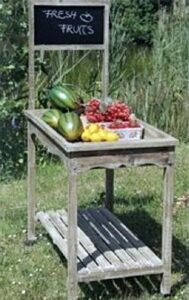 Fruit stands are like other community offerings we shouldn’t regulate unless there’s abuse, including lemonade stands, free neighborhood book libraries, occasional garage sales, and seed libraries. Let’s build communities by encouraging neighborhood interaction around local food. Allow more homes to raise honey bees. Bees were only allowed in rural areas of our city, predominantly large lots in Olivenhain. We are now allowing up to two bee hives for residents in every residential zone as long as there are at least 35 feet between the bees and nearby homes, and 25 feet between the hive and the street. The ordinance seems straightforward now but it took a tremendous amount of work to consider all the possible changes in other cities’ urban agriculture ordinances, collect public feedback, weigh priorities and sort through possible amendments. Council Member Tony Kranz deserves a lot of credit for this advancement, particularly on the bee hive regulations. He’s a determined bee advocate, and the videos about bees presented at our meeting were entertaining and informative. 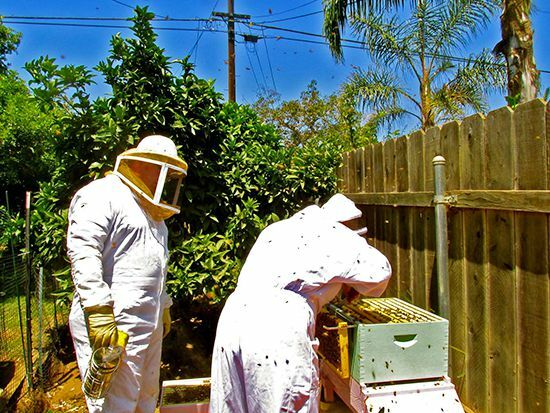 Here are Council Member Tony Kranz (l) and James McDonald of the Encinitas Bee Company, checking a hive. James is a crack-up; if you ever need a hive removed please call him instead of poisoning them. My colleague, Deputy Mayor Lisa Shaffer, also deserves recognition. She graciously allowed me to take her place on the subcommittee when I was elected. Together, Tony and Lisa devoted significant time and effort to organize the wide-ranging feedback about what the urban agriculture ordinance should include. Their analytic groundwork was essential to our success. City staff member Laurie Winter also worked nearly full-time on this for months, and we appreciate her hard work. We unanimously approved an eight-home project on a vacant lot off MacKinnon overlooking the freeway. We appointed all 17 applicants to the Youth Commission. We authorized design and construction of a parallel gravity sewer line for system redundancy around the Carlsbad Poinsettia Coaster Station. The project involves constructing an underground pedestrian tunnel connecting the east and west pedestrian platforms and shifting two railroad tracks to the west. The sewer project will be done at the same time. We are sharing the cost because the sewer projects cross city boundaries and serve both Carlsbad and Encinitas. As the Chair of the San Elijo Joint Powers Authority, (the Cardiff wastewater district), I’m proud of the agency for finalizing a project with the Encinitas Ranch Homeowner’s Association to provide recycled water to their landscaping and trails. The project involves installing 1.5 miles of recycled water pipes and a small pump station, saving 45 acre-feet of drinkable water every year. That’s enough water for about 100 households. For all you soccer families, here’s a San Diego Union-Tribune article about the status of lights at Leo Mullen field. 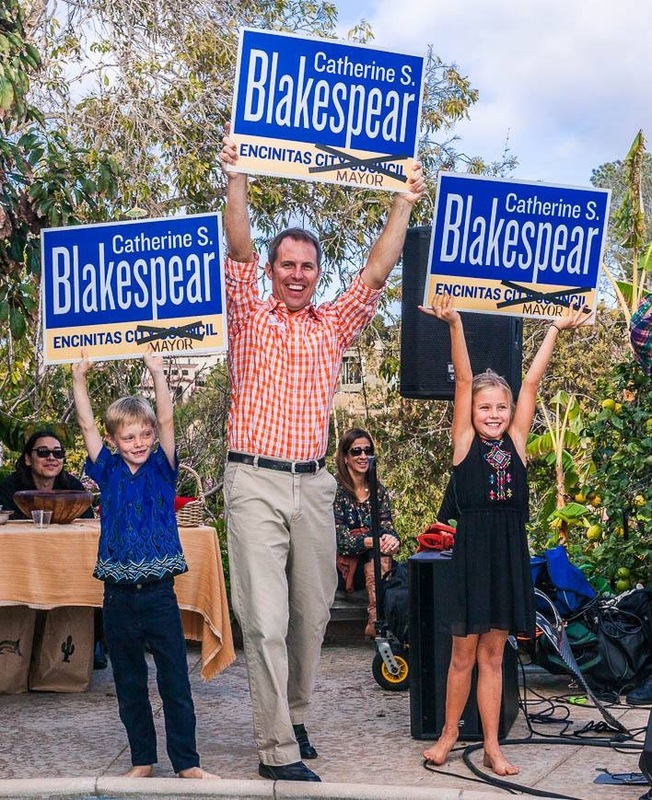 My campaign to be the next Mayor of the City of Encinitas is off to a strong start! I’ve spent some time going door-to-door listening to people’s ideas and concerns about Encinitas and I’m always learning something new. For instance, noisy leaf blowers that stir up dust are a major issue for some residents. Walking in my Cardiff neighborhood, the issue of the rail trail comes up the most frequently, with residents expressing views on all sides of this issue. The rail trail working group has had 23 applicants so far, and the deadline to apply is next Thursday, May 19. Here’s the application. I’m grateful for all expressions of support! 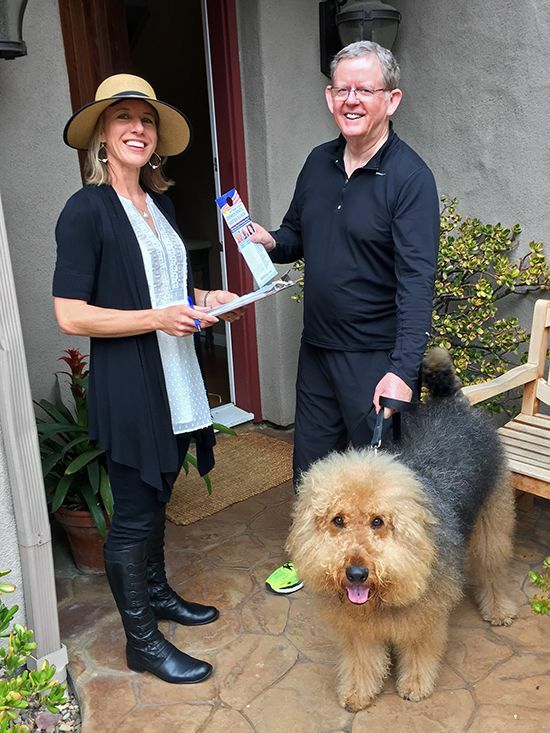 This weekend, I went door-to-door listening to residents’ ideas about the future of Encinitas and reminding them to vote in our June 7 primary (the mayoral and city council elections aren’t until November 8). Leucadian Jim Pawlisch and his dog Max were happy to contribute their opinions! Last but not least, Tasha Boerner Horvath is running for a seat on the Encinitas City Council in the November 2016 election, and she’s conducting a survey to better understand Encinitas residents’ priorities. This is a great opportunity to share your views about the important policy issues in our future. The survey is here. Please take a moment to fill out and register your preferences.